These are by precinct, rather than ward, and so provide a lot more granular detail. 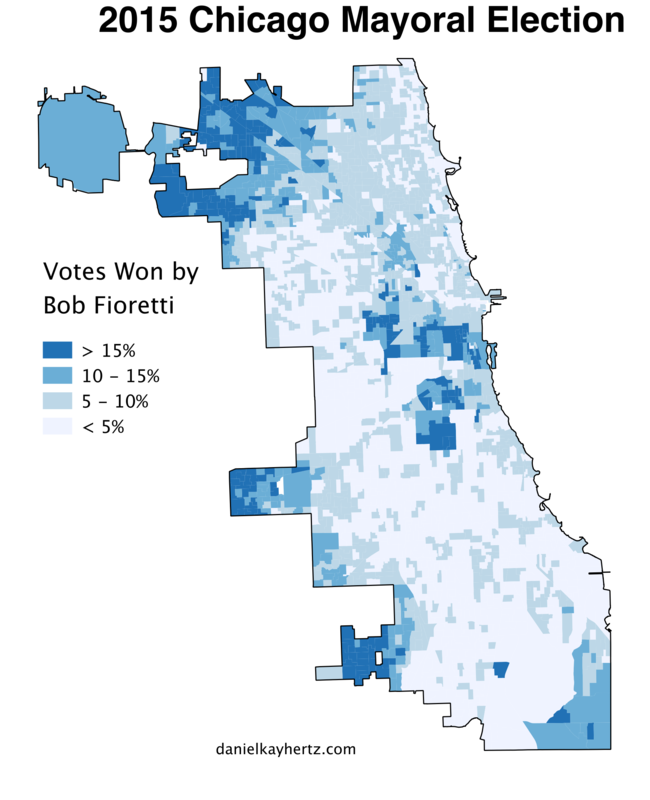 I’ve kept all scales and colors the same, except where new categories were required (because Fioretti won a few precincts, but no wards, for example). Thanks to Max Rust of the Sun-Times for the data. 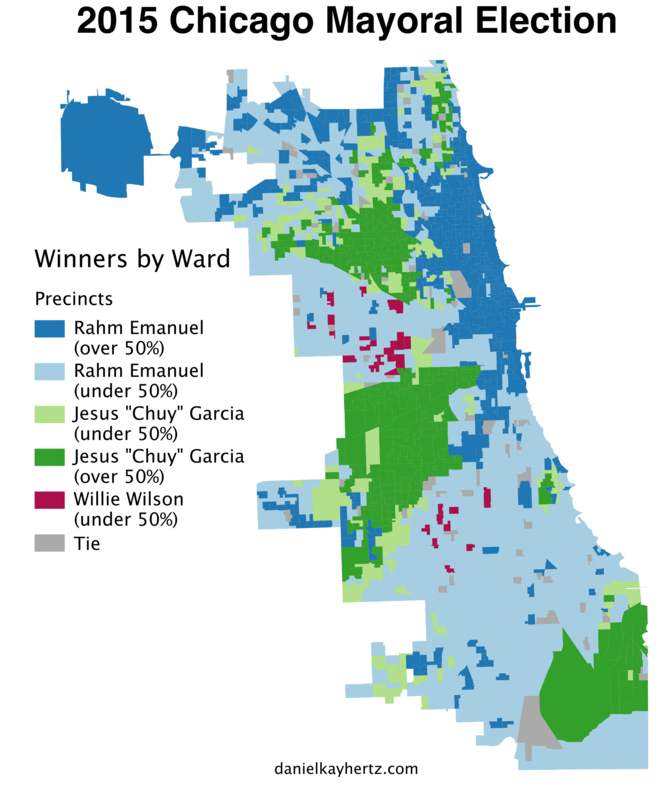 Great graphics from Daniel Kay Hertz showing how the Chicago mayoral election panned out. 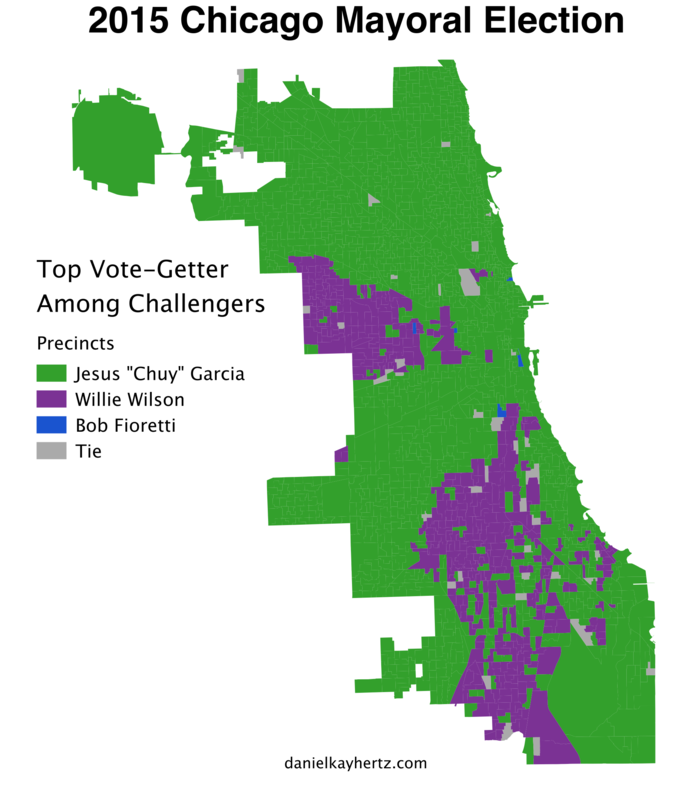 Presuming all the votes for Fioretti and Wilson go to Garcia in the run-off, what would a Rahm vs Chuy map look like? That’s the second map. >50% goes to Rahm, <50% goes to Chuy. 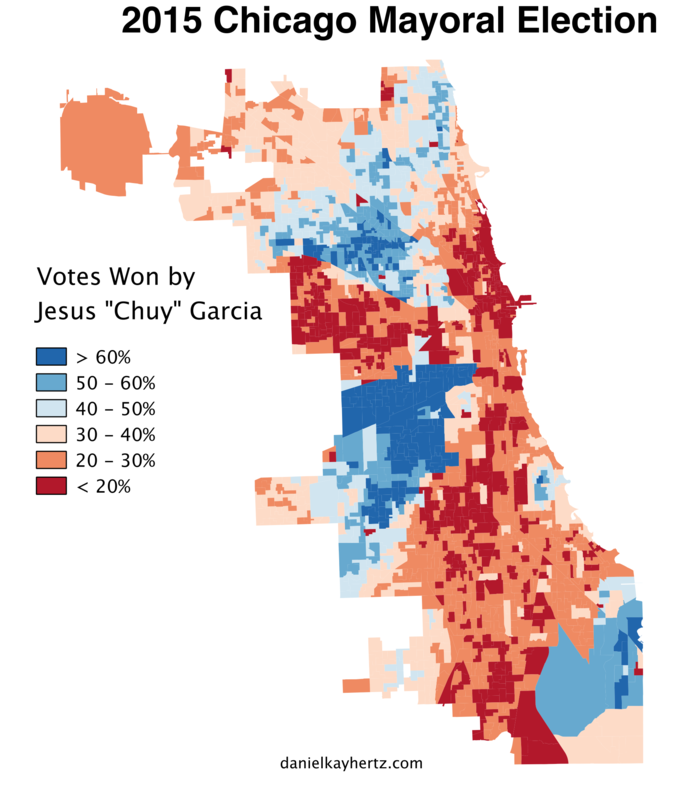 Chuy got significantly more votes in the majority-Latino neighborhoods than in the majority-black neighborhoods. 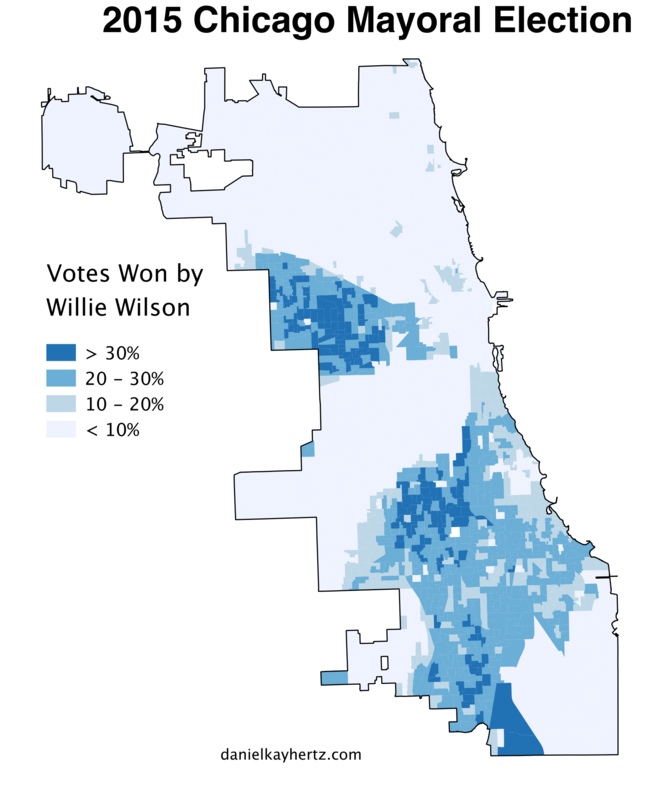 This is partially because Willie Wilson “stole” a lot of the votes that would have otherwise gone to Chuy. 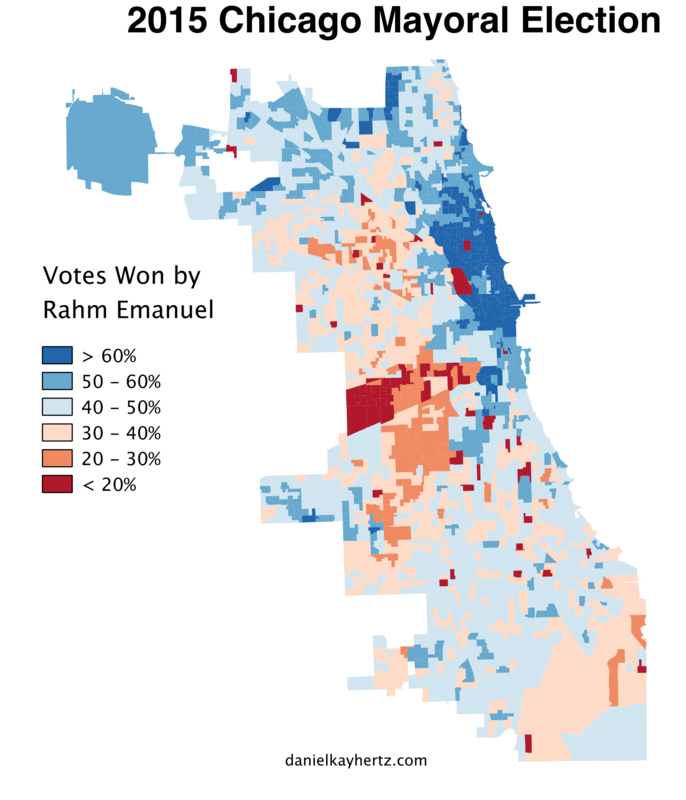 However, it’s also worth noting that Rahm got a higher percentage of votes in the majority-black neighborhoods than in the majority-Latino neighborhoods. 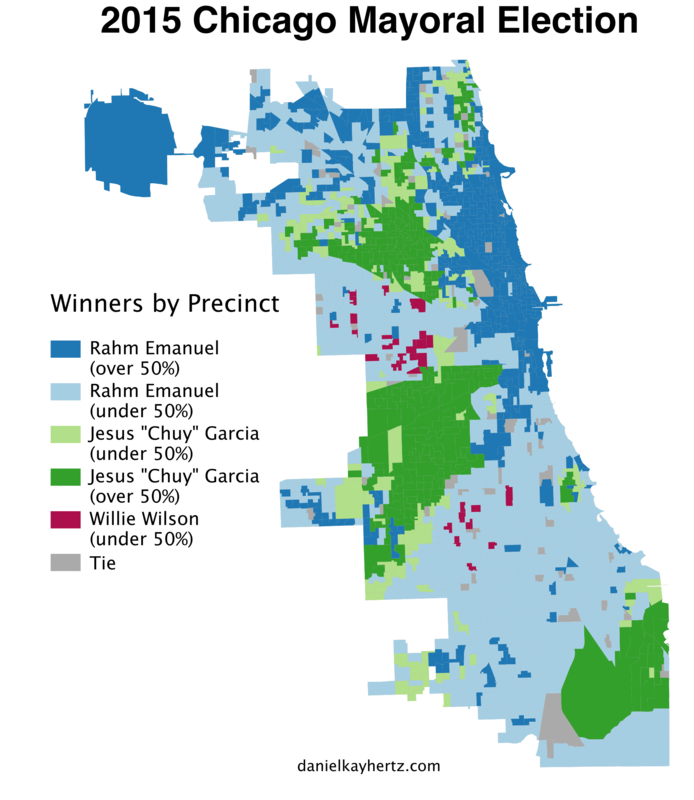 Most precincts on the South and West sides were either 30-40% Rahm or 40-50% Rahm, while many precincts on the Southwest and Northwest sides were under 30% Rahm. Also, it looks like Wilson had the most support in the poorest predominantly black neighborhoods (Engelwood and much of the West side) and had the least support in middle class black neighborhoods (Chatham, Calumet Heights, Ashburn, etc). Can anyone explain this difference? I think it’s kind of awkward to explain, but when I said that I kind of liked wilson in a sort of ‘funny uncle’ kind of way to a black coworker of mine, she responded with what could best be called indignation, and quite a bit of hostility to his campaign. I think middle class blacks may be kind of embarrassed by him, as he seems kind of old fashioned, or perhaps his speech mannerisms, or maybe the awkwardness of his commercials. The way some people respond to sarah palin or bush might be a good analogy. Willie Wilson is an “entrepreneur” in fast food franchises, church on tv, and medical supplies, with no political experience that trumpets the fact that he succeeded in life despite only having a 7th grade education. Chuy Garcia earned both his bachelors and masters in Political Science from UIC, served 6 years as an alderman, 6 years in the Illinois state senate, spent a decade as a community organizer in Little Village, and in 2010 became a member of the Cook County Board of commissioners, appointed floor leader by Toni Preckwinkle. You tell me which is the more credible candidate. Has preckwinkle endorsed him for mayor? Although I don’t usually care about endorsements, hers would actually mean something. Preckwinkle is not going to endorse anyone in the runoff.